Nancy has been a commercial photographer for over thirty years. After working out of New York City for twenty-five years she is now working out of her studio in Boca Raton, Florida. Her clients include ad agencies, magazines, deisgn firms, book publishers and pharmaceutical agencies. 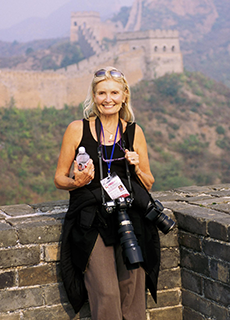 Nancy specializes in people / lifestyle and travel photography. Traveling to wonderful places has always been a big part of Nancy's life and she feels very lucky to be able to combine her love of traveling with her love of photography. She has had five photography books published and the last one "Simply China" was released in August 2011. Click here to purchase from Amazon. To purchase an autographed copy from Nancy herself, click here. Getty images sells Nancy's stock and she is continually adding people / lifestyle and travel images to her collection.